Past week the guys from DNA sent me some CFD renders of their new 2016 platform. Now they want to release video above with hull hydrodynamics simulation against their current version. Analyzing the renders and videos, I tried to figure out how the 2016 platform will look, worked on the renders published in this post, which are only my guess on the final looks of the Dna 2016 platform. they also covered that specific area to hide some new feature. Beams seem to be palced further forward from their 2015 boat. Their foil design will remain pretty much the same, those are good news. Mischa Heemskerk's work along the factory team with the decksweeper Main & aero tramp setup (and previously with foil R&D) was proven a superior weapon at Punta Ala, and has set the standard for the new A-Class Main sail design (along with Glaser / Melvin work from Takapuna) . Now Dna goes a step further in the aero oriented platform design, with additional visible changes on the hull bottom shape which will affect the aero/hydro drag of the hull in floating mode&foiling modes. 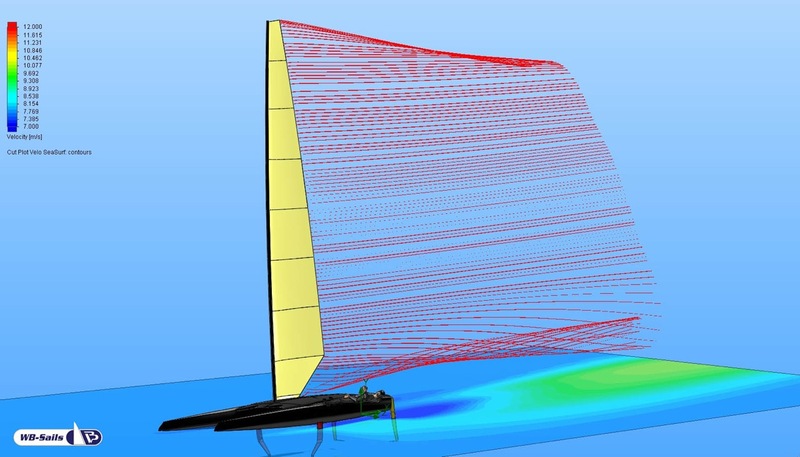 CFD above shows additional pitching motion for the new version, but I guess they are also looking for less "sticky" hull. This changes are getting the As in "Stealth" mode, and if the Class was already leading development, this will put it a step above. How much gain Dna will achieve is yet not known, and I doubt it will have the impact we saw at Punta Ala as the others brands are doing their own R&D, but in any case the Dutch yard continue to push for optimizing flight performance. Render Left: Original CFD by DNA. AC Teams should start playing again in the A-Class, they are starting to become an scaled version of their Turbo 45 & Future AC48s. As seen at past Cup by Team New Zealand scaled & on te water tests are the mandatory complement for any new design theory or solution. 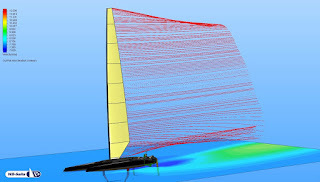 A-Class builders are the Nr 1 believers of the "Test , develop, Test " method, which in the Era of high technology & simulations remains as a great Legacy of past boat builders. Holland Composites is working now on the new tooling and they will be releasing more info soon.